I tried following the steps you listed, but it didn't reproduce the problem for me. I'm using a newer blender version (2.70a) but I've used 2.66 previously without problems (I think). Can you share the .blend file? By saying "didn't reproduce the problem", you mean your exporting process actually exported the animation? 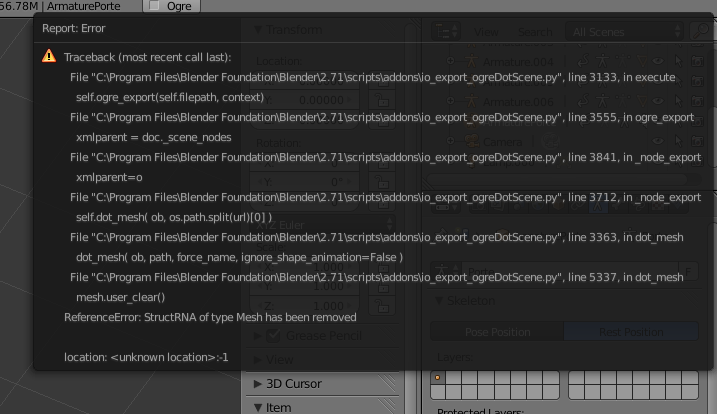 I used the exporter version mentioned in my last post, but now I used Blender 2.67, but having the same problem. I'm attaching a zip with the .blend file, all the exported files and a screen capture of Blender right after the export process. I found your problem. In the blend file you sent me, you've animated the location of the armature object instead of the bone. When you add keyframes, make sure you select the armature object, change the 3d view into "pose mode", then select the bone, apply your translation, rotation or scale, and then insert the keyframe. The exporter doesn't look for animation keyframes at the object level, only on the bones. lunkhound wrote: I found your problem. In the blend file you sent me, you've animated the location of the armature object instead of the bone. Thanks lunkhound, it's working now. One thing to mention is that the max length of any animations being exported is limited to the "End:" value of the Timeline window, if I'm working with 30fps and have, let's say, 2 animations, with 15 frames (0.5 secs) and 60 frames (2 secs), after exporting I end up with animations' length 0.5 and 1 second, meaning that for the animation with 60 frames only the first 30 frames are exported, not a big deal though, just need to set the "End:" value to the max of all animations available, but strange anyway. I also need to figure out how this "Apply" command exactly works for the armatures when they are scaled, if they need to be "apply"ed for Location or Scale. I will continue experimenting with Blender and this great exporter. Thanks for the bug report. Next time I'm looking at the exporter I'll have a look at fixing that. lunkhound, when dealing with textures in Blender, so far I'm using a Diffuse and a Normal Map, so the exporter correctly generates a material with two "texture_unit" tags, is there already a way that the exporter passes the name of those texture unit in order to end up with something like this in the .material file?? Where "diffuseMap" and "normalMap" are the names I give to each "ID name" (texture layers) in Properties -> Textures. I'm asking if this feature already exist in the current exporter's version. I don't use the exporter to generate material scripts in my workflow, so I've never tried to figure out how it is supposed to work. I've not seen any documentation about it either. From a quick look at the code, I can see there is a lot of code in the exporter for dealing with OGRE material scripts. There is code for parsing material scripts as well as for generating them. However, it isn't clear to me how it is supposed to work. Then exported the model and the animation with the ogre-exporter 0.6.0 into this xml-format and then used them with the OgreXMLConverter to create a .mesh and a .skeleton file. The green color comes from the light, but I also dont know, why the textures are so messed up. But the animation is worst of course. Why is this animation so messed up? Is there something wrong with my export settings, or is there a problem with the inverse kinematics? Hi Funatom, I'm pretty sure your problem is that you didn't reset rotation and scale in Blender, to do so, you have to select your mesh in Object Mode, hit COLTROL+A and select "Rotation & Scale", this way you'll notice that in the Transform window (hit the n key while the mouse pointer is in a 3D View window) the Rotation goes to <0,0,0> and the Scale to <1,1,1>, every mesh should always be reset this way to be properly displayed and animated in Ogre. Regarding your material, the above reset should fix that too, if not, post your .material entry here to check it. 1.- By default, Blender stores meshes as flat faces though it displays them as smooth, to have Blender smooth meshes in Ogre, select the mesh, go to Edit Mode, select all faces (hit A key), hit CONTROL+F and select "Shade Smooth". 2.- The OgreXMLConverter can be called from the exporter automatically if you place it in the following directory: C:/OgreCommandLineTools, place the OgreCommandLineTools.exe and the OgreMain.dll. This way, right after exporting you'll end up with the two XML files plus the already serialized .mesh and .skeleton files. Finally, in very few cases, it has happened to me that if I apply an armature to a mesh, and later do the reset to that mesh, the animation in Ogre is a complete mess, in that cases what I had to do is unparent all bones from the mesh, erase the automatic Armature modifier in the "Objects Modifiers" window, and erase the Vertex Groups in the "Object Data" window, just mentioned if this happens to you. RigoCL wrote: Hi Funatom, I'm pretty sure your problem is that you didn't reset rotation and scale in Blender, to do so, you have to select your mesh in Object Mode, hit COLTROL+A and select "Rotation & Scale", this way you'll notice that in the Transform window (hit the n key while the mouse pointer is in a 3D View window) the Rotation goes to <0,0,0> and the Scale to <1,1,1>, every mesh should always be reset this way to be properly displayed and animated in Ogre. I'm a 95% noob with this subject so pardon my ignorance: why isn't it already done by the exporter's code? Or simulated on export? having trouble exporting animation, rest exports fine. tried everything on that i found in the first few pages back. all i get when exporting is my_animations in the xml file of skeleton. i had a friend animate it and i did the rigging and modeling. i am using blender 1.7. i attached the model with one animation. Simple, when Blender does things, it does them with some mathematical approaches that would be impossible (and unnecessary) for the exporter to do it again. MugenAttack wrote: having trouble exporting animation, rest exports fine. tried everything on that i found in the first few pages back. Hi MugenAttack, when you end up with an animation named "my_animations" is simply because you forgot to hit the "snowflake" in the NLA Editor, the little one surrounded by a black square at the right of your animation's name. ugh, thank you, and kinda of did that but after looking closing i did it in the wrong part. when your in the nla editor it shows the snowflake button also for the mesh and i think blindly out of frustration kept pressing it under the mesh. i guess to help others you do it under the armatures and not the mesh. MugenAttack wrote: ugh, thank you, and kinda of did that but after looking closing i did it in the wrong part. when your in the nla editor it shows the snowflake button also for the mesh and i think blindly out of frustration kept pressing it under the mesh. Actually, the only animations that the exporter will consider are those applied at bone level by activating the Pose Mode in the 3D View window, so the animation of the mesh you mention won't get exported (the one that shows a triangle with dots in the NLA editor). Or maybe I'm basing my assumption on recent Blender API which seems almost fully accessible through Python code, and this exporter is based on older Blender? The exporter already does modify the scene in various ways for exporting, and then restores the state afterwards. So I am fairly certain it would be possible. It might be best to make a copy of the object, normalize the transform on it, do the export on the copy as usual, and then delete the copy. Thus leaving the original untouched. I'm not sure if that would work with armatures and animations though. It might get complicated, and the exporter is already 7500 lines of python that nobody cares to understand. EDIT: I've fixed the issue! I plan on making a video tutorial on how to export from Blender to OGRE soon, explaining what I've learned. Long story short: If you're using IK bones, you need to keyframe the bones it is affecting as well. I posted a thread in the 'Help' section about the issue I'm having, but this thread seems a far more appropriate place. I've gone through this entire thread over the past few hours, excitedly trying a plethora of "fixes" other people with similar issues to me have had success with, but unfortunately, nothing has worked for me thus far. (On top of that, I've been researching / playing around with this issue for the past week). Anyways, I'm having issues combining my character's top and bottom walk animations (in the way Sinbad does). I've successfully exported Sinbad and gotten him to work in this manner, yet can't get my own character. I'm just so lost as to what the issue is. I've added a root bone at 0,0,0. I've done the NLA strips correctly (as I've gotten Sinbad to work). I believe I've got the correct exporter settings (for example, from this guide http://wiki.openclonk.org/w/NLA_Hijacking, as well as any other suggestion in this thread). I believe I've done my animations correctly. I've tried adding a "blank" NLA strip to the beginning as hartsantler had said (although I don't know if that's truly necessary anymore with the newest versions of the exporters). I've tried lunkhound's exporter. My character has a scale of 1 (I've applied all transformations, etc. long before I tried exporting him). Nothing has changed a thing for me. This is where it gets interesting: Individually, the animations work fine. So, if just the top animation is added, his arms move fine. If just the bottom, his legs walk flawlessly. Because of this, I don't think it's an issue with IK bones (I've read conflicting statements on if IK bones truly work in OGRE. Regardless, I've keyframed all the respective bones as well [so, I just animated with the controlling bones, and then went back and keyframed the other bones], and that still caused the same issues when combining the animations). If anyone could *please* shed some light on this hopeless situation, I would be eternally grateful. FYI, I cannot get OgreMeshy to work, which is unfortunate considering it may shed some insight on the situation, so if someone could take a peek at it in there and let me know if anything is awry, that would be much appreciated! Last edited by RonnieNeeley on Mon Jul 14, 2014 2:25 am, edited 1 time in total. RonnieNeeley wrote: I've read conflicting statements on if IK bones truly work in OGRE. Hey I know you solved this in the other thread (before this got cross posted), just wanted to be totally clear on this point. OGRE does not support IK at all. If the animation system in your DCC tool is using IK, you will have to bake that down onto your skeleton so that everything you export is FK based. Generally you would use IK targets to animate, but you keyframe the actual skinned bones. RonnieNeeley wrote: I posted a thread in the 'Help' section about the issue I'm having, but this thread seems a far more appropriate place. If the animations work fine individually in OGRE, then it is likely not a problem with the blender scene (or the exporter). I would think that the problem is how the skeleton is being setup in OGRE. In particular, are you doing something like this for the object? Also for combining animations at the same time, you may need to call "setUseBaseKeyFrame()" on the animations to tell OGRE which pose each of the animations should be relative to. By default, OGRE uses the skeleton bind pose. The "base key frame" should be a pose where the bones that should be untouched--like the top half of the character for the bottom animation--match exactly for ALL frames of the animation. Otherwise you'll get unwanted extra rotations. So if you aren't setting the base key frame explicitly, then your animations should be authored such that the bones that should be untouched match the bind pose. The top half of the character should be in bind pose for the bottom animation. For details, read the comments in OgreAnimation.h, next to the setUseBaseKeyFrame function. I'm on blender 2.7 If I want to use this plugin I have to install Blender 2.6 or the plugin is compatible with 2.7 ? I have been using the exporter with Blender 2.70a and haven't noticed any problems. Without knowing any details about what isn't working, I couldn't even guess what the problem might be. I've never even heard of this jPCT engine before. Which version of the exporter are you using? What kind of scene are you trying to export? Do other scenes export, or does it fail even on a basic cube scene? I'm using blender2ogre, and I'm having difficulties exporting bone animations. My current interpretation is that bones are not exported as expected because I used multiple armatures and thus modifiers on a single mesh. 2. add two armatures with two bones each, renamed etc. plays nicely within blender (see attachment). The exported Cube.skeleton.xml only contains bones of one of the Armatures (the one added as the last modifier, coincidently or not). I've played around with settings and stuff for quite a while, but to no avail. When I remove the second armature modifier, the first one is exported though, suggestion that the setup itself is sound+sane. I've a complex rigged model I'd like to export that has been build in a similar way, and re-doing all of the animations would be quite some effort, so if there is some solution to solve this, I would be happy to know. I use Blender 2.71 and blender2ogre 0.6.0. LGW wrote: I'm using blender2ogre, and I'm having difficulties exporting bone animations. My current interpretation is that bones are not exported as expected because I used multiple armatures and thus modifiers on a single mesh. Yes I'm pretty sure the exporter is assuming that there is only a single armature per mesh. The exporter would need some modifications to support multiple armatures. Search the code for "findArmature" and it should take you to the right spot. I'm not sure how much work it would be. LGW wrote: I've a complex rigged model I'd like to export that has been build in a similar way, and re-doing all of the animations would be quite some effort, so if there is some solution to solve this, I would be happy to know. It seems like it should be possible to set up a second mesh in blender (a copy of the original) with just a single armature and constrain the bones of the second mesh to follow those of the first mesh, and use that to transfer the animations over to something the exporter can deal with. I've never done that before, but it might be an easier way to solve your problem than trying to figure out how to modify the exporter to deal with multiple armatures.